All people and projects who have received funding from each HBHL funding program are listed below. For this first competition in Fall 2017, each of the four HBHL Research Themes was invited to submit an application based on a series of workshops held in Summer 2017 in which research priorities were identified. A panel of 14 peer-reviewers from primarily international universities was established based on lists of potential reviewers provided by all applicants. 3-4 reviewers evaluated each application and provided scores and comments. Applicants were requested to provide written responses to the reviewers' comments to improve the proposals. Reviewer comments and applicant responses were discussed by the HBHL Strategic Steering Committee, who approved funding for all four applications. Individuals expressing conflicts of interest withdrew themselves from evaluations and discussions as necessary. Funds were disbursed starting in Spring 2018. An open competition was launched in Fall 2017, for which 85 Letters of Intent (LOIs) were submitted. The LOIs were evaluated by 12 members of the HBHL Research Management Committee as well as three external reviewers, with 4-5 reviewers evaluating each LOI. Each evaluation consisted of a score out of 100 based on provided criteria, which were converted to z-scores to normalize between evaluators. The Research Management Committee invited the top 22 LOIs to submit a full application. All 22 applicants submitted a full application. A panel of 25 national and international evaluators, none of which were from McGill, was convened based on lists of potential reviewers provided by all applicants. Each application received at least 4 reviews. Any reviewer who had co-authored a publication with an applicant within the past 6 years, or self-reported conflict of interest, was excluded from reviewing the relevant application(s). An average score for each application was calculated based on all of its evaluations, and presented to the HBHL Research Management Committee in an anonymized fashion, i.e., the names of Applicants, co-Applicants and collaborators, and the project titles, were removed. The HBHL Research Management Committee recommended funding of the top 12 applications ranked on average total scores. The HBHL Strategic Steering Committee (having access to the same anonymized scores) approved funding for these 12 applications. Funds were disbursed starting in Spring 2018. Projects are listed below in alphabetical order by applicant surname. The first round of the McGill-Western Collaboration Grant (MWCG) competition launched in February 2018. A total of 23 applications were received and reviewed independently by panels from both institutions. The MWCG Working Group (representing both institutions) reviewed an anonymized list of applications, including the budget and ranking provided by evaluators, and recommended that the top seven applications receive funding. The HBHL Strategic Steering Committee and the BrainsCAN Executive Committee approved the selection, listed below. Learn more about these projects. Establishing Neurophysiological Evidence for the Treatment of Brain Injury in Intensive Care Units. Identifying the neuronal activity of adult-born neurons in the dentate gyrus that supports behavioural pattern separation. Towards a translational model of the human-like Alzheimer pathology in a primate species. Revealing the fundamental neuronal mechanisms underlying memory function in mice and non-human primate marmoset CA1 area of the hippocampus. The Neuro-Partnerships Program envelope of $3.1 million is available until 2023. 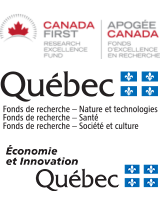 Under this program, Healthy Brains for Healthy Lives (HBHL) provides 1:1 matching funds for projects with a high potential impact on biopharmaceutical research through existing programs offered by the Ministère de l'Économie et de l'Innovation (MEI). Co-funding is available for up to 40% of the total project cost. MEI co-funding is available through CQDM Quantum Leap and SynergiQc programs; and the MEDTEQ Industrial Consortium for Research and Innovation in Medical Technologies. Read more about this program and the evaluation process. A drug-screening platform to increase protein expression levels for the treatment of neurological disorders. Grants are awarded based on application from the Dean of the hiring faculty. The amount is negotiated between the hiring faculty and the candidate. The HBHL portion of the start-up grant (listed below) may not constitute the full amount of the recipient's start-up funding. An open competition was launched in Spring 2017, for which 221 complete and eligible applications were received: 46 at the Master's level, 117 at the doctoral level, and 58 at the postdoctoral level. An evaluations committee consisting of 34 McGill faculty from diverse departments and faculties was formed. Each application was assigned to three evaluators, pre-matched to minimize conflict of interest. Each evaluator reviewed applications from the same level of study, and ranked applications relative to each other. Applicants with the highest average rankings were considered for awards. The evaluations committee recommended 38 awards. Nine Master's students each received $10,000 per year for 1 year. 24 doctoral students each received $15,000 per year for 1 year. Five postdoctoral fellows each received $35,000 (plus benefits) per year for 1 or 2 years. An open competition was launched in late 2017, for which 43 complete and eligible applications were received. An evaluations committee consisting of 9 McGill faculty from diverse departments and faculties was formed. Each application was assigned to three evaluators, pre-matched to minimize conflict of interest. Each evaluator ranked applications relative to each other, and applicants with the highest average z-score rankings were considered for awards. The evaluations committee recommended seven awards. All recipients received $60,000 (plus benefits) per year for 2 years. An open competition was launched in Spring 2018, for which 132 complete and eligible applications were received: 50 at the Master's level, and 82 at the doctoral level. An evaluations committee consisting of 24 McGill faculty from diverse departments and faculties was formed. Each application was assigned to three evaluators, pre-matched to minimize conflict of interest. Each evaluator reviewed applications from the same level of study, and ranked applications relative to each other. Applicants with the highest average rankings were considered for awards. The evaluations committee recommended 54 awards. Twenty Master's students each received $10,000 per year for 1 year. 34 doctoral students each received $15,000 per year for 1 year. 3 Master's Rana Ghafouri-Azar Pia Wintermark May sildenafil repair injury to the cerebellum following neonatal hypoxia-ischemia? The Knowledge Mobilization program was launched in March 2018. Applications may be submitted at any time. Applications for workshops (up to $20,000) are evaluated regularly by the HBHL management. Applications for larger projects (up to $100,000) are evaluated quarterly by an external peer-review committee. In November 2017, each of the HBHL Subcommittees was invited to submit one or more applications based on a series of workshops held in Summer 2017 in which research priorities were identified. 10 proposals were received and evaluated by a committee composed of McGill faculty members with extensive knowledge and experience in the operations and management of core facilities. The committee recommended funding of 8 proposals, as listed below. HBHL’s Visiting Fellows Program aims to foster inter-institutional exchanges for internationally recognized researchers. This program has been discontinued.